JOIN THE PHOTO COMPETITION! Show the world how much Lasallians value love, friendship and community by submitting photos along with a one sentence caption at www.greenlovegrows.ph. Photographers of the ten best photos will receive a special gift from De La Salle Philippines! As ONE LA SALLE, let us show that Green Love Grows! 1. If you wish to upload using Facebook, simply click on the event and find in the page the upload a photo section. 2. You may also upload your photos at http://greenlovegrows.multiply.com if you have a multiply account. Just join the multiply group and upload your photos. 1. 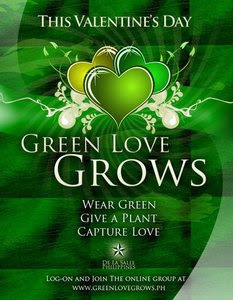 Submit as many photos as you want on love, friendship, community and the theme “Green Love Grows” by uploading them at www.greenlovegrows.ph. Maximum file size per photo is 3MB. 2. The competition is open to all the members of the Lasallian Family: students, parents, Brothers, administrators, faculty, academic service personnel and alumni. You may submit entries up to 21 February 2009. 3. 10 winners will receive a special gift from De La Salle Philippines.